The red brown soil and clouds of dust blended with the painted coral walls of their school. Our route followed meandering mini canyons caused by erosion during the rainy season. The few scattered Acacia or Thorn trees offered little relief from the heat. When we arrived, several curious children ventured out of the classroom to have a better look at these strange wazungus (literally translated - people who walk in circles and a common word referring to us - white people)! The head teacher, Mr. Loatha Paulo from the legendary Maasai tribe, greeted us warmly in typical Tanzanian fashion. He has twinkling eyes and a calm lovely manner with the children. There was no evidence of whacking sticks here! 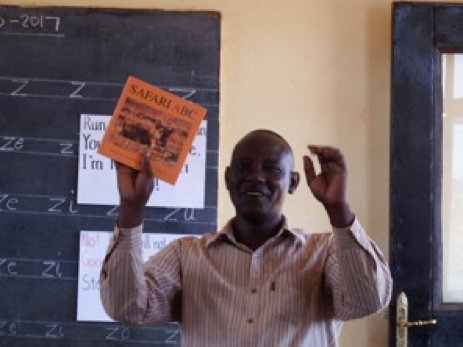 At Simba Milima there are 82 children and two teachers, small class sizes in comparison to most Tanzanian schools. Right after the traditional welcoming comments, Loatha began discussing his number one concern – WATER! Not a drop to drink! Everyday people walk long distances and patiently stand in line to obtain their daily water needs. Some are fortunate and can push their pails of water in carts or haul it in barrels driven by humped back zebu cows. Access to water is a troubling issue in Karatu District. Right now something needs to be done for Simba Milima Primary. 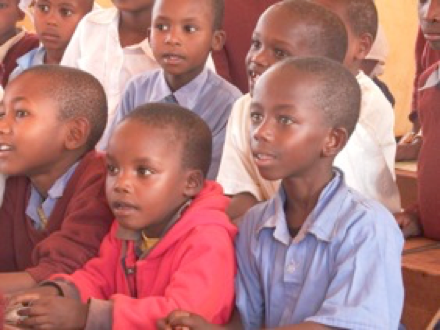 The African Book Box is hoping to be part of a solution to bring water to this school. Ruth had the perfect book by Susan Verde to read to the class. “The Water Princess”, written in poetic language and beautifully illustrated, is about a young girl who dreams of bringing clean drinking water to her African village. We brought several African books, told stories and sang songs with 82 delightfully enthusiastic children. The power of culturally relevant stories was reflected in the radiant smiles of the children and their teachers. It made our hearts sing to experience their enjoyment as they listened so intently to the African stories we are privileged to share. By now it was lunchtime and children quickly emptied the classroom, lining up outside the rudimentary school kitchen with their plastic and tin bowls. The cooking mama and papa prepared a large sufuria or pot of beans cooked on three stones. The children sat on the parched ground under the midday sun to enjoy their lunch. They were keen to share their bowls of beans with us! Several parents accompany these young children on their 5-6 kilometer walk to school, vigilantly looking out for hyenas sharing their habitat. Maisha magumu – Life is hard!